When Zicafoose first read “Tectonics” 10 years ago, she said she was blown away by the “brilliant contrast” Kooser created between the fading memory of a romantic relationship and land shifting to create a new world. Zicafoose’s use of ikat, a complex, ancient Malaysian weaving method in which one resist-dyes fibers before weaving them, and her “unabashed” use of color allow her to approach the movement of land masses in this abstract, humanistic manner. “I remember reading that poem years ago and thinking there’s going to be a time for me to starting weaving about this,” Zicafoose said. And that perfect time turned out to be a few years ago, Zicafoose said, considering the changing environmental state of the Earth and the fact that such changes have become a part of popular culture. These environmental changes not only lead to disasters but also contribute to what will be the history of the planet. 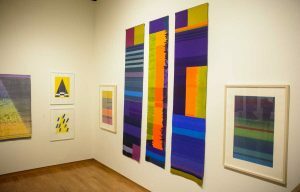 “Timeline,” one of the three tapestries making up the center triptych of the exhibit, conveys bright stripes representing the Earth’s development in conjunction with humanity. “The Earth is no different than the humans on it — we’re all shifting and changing at the same time,” Zicafoose said. The collection also includes many pieces from Zicafoose’s five-yearlong series, “Mountain for the Buddha,” which references landscape, geometry and sacred space. One of these works, “Mountain for the Buddha- Envy,” includes a triangle filled with intricate black and white mazes on top of a deep green background. This piece was guided by Zicafoose’s intuition. When she started, she didn’t know the name, but then the color began to influence meaning. 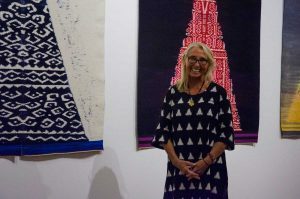 Museum director Robert Saarnio said the museum is thrilled to present the work of this internationally renowned tapestry artist and rug weaver. 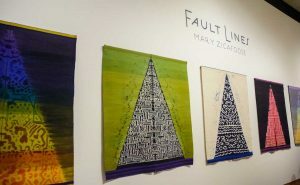 If you missed Zicafoose’s art reception last night, don’t worry — she’ll return to Oxford from Omaha, Nebraska, in a few months for the eighth annual Oxford Fiber Arts Festival Jan. 25-28. Her exhibit is on display at UM Museum until next February.